New Unlocked Samsung Galaxy S7 G930F 4G LTE Smartphone 32G Gold 1Yr Wty. 1X Samsung Galaxy Note8. 1X USB data cable. New HUAWEI HONOR 8 Octa Core Dual Sim 4G LTE Smartphone Gold 4G /64. Toys,Hobbies. xmas gifts. 2G bands:GSM 850 / 900 / 1800 / 1900 - SIM 1 & SIM 2. Samsung Galaxy Note 8 Dual SIM 256GB 4G LTE Smartphone. 4G bands:LTE. Technology:GSM / HSPA / LTE. The Galaxy Note8 is your portal to a new world when connected to this range of devices and interfaces. 1 x Samsung Galaxy Note8 Dual SIM 4G LTE SM-N9500 256GB Midnight Black. 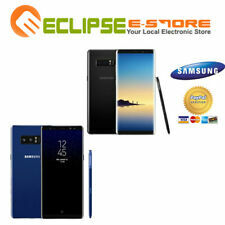 SAMSUNG GALAXY NOTE8 Dual SIM 256GB 4G N9500 BLACK Clear c@se. /128GB microSD Kit/ SAMSUNG GALAXY NOTE8 Dual SIM 256GB 4G N9500 BLACK. 6GB RAM / 256GB ROM. 100% Factory Unlocked . Samsumg Galaxy  Note 8 Dual Sim N9500 256GB Smart Phone. Speakerphone Yes. Get crisp photos even when it's dark and it's difficult to keep your phone steady. 1 x Samsung Galaxy Note8 Dual SIM 4G LTE SM-N9500 256GB Midnight Black. Tempered Glass Kit // SAMSUNG GALAXY NOTE8 Dual SIM 256GB 4G N9500 M. BK. / 32 GB Driving Kit / SAMSUNG GALAXY NOTE8 Dual SIM 256GB 4G N9500 BLACK NEW. 1 x Samsung Galaxy Note8 Dual SIM 4G LTE SM-N9500 256GB Midnight Black. /128GB microSD Kit/ SAMSUNG GALAXY NOTE8 Dual SIM 256GB 4G N9500 BLACK. / 10000mAh Power Bank Kit / SAMSUNG GALAXY NOTE8 Dual SIM 256GB 4G N9500 BLACK. 1 x Samsung Galaxy Note8 Dual SIM 4G LTE SM-N9500 256GB Midnight Black. / 32 GB Driving Kit / SAMSUNG GALAXY NOTE8 Dual SIM 256GB 4G N9500 BLACK NEW. / 10000mAh Power Bank Kit / SAMSUNG GALAXY NOTE8 Dual SIM 256GB 4G N9500 BLACK. 1 x Samsung Galaxy Note8 Dual SIM 4G LTE SM-N9500 256GB Midnight Black. / 32 GB Driving Kit / SAMSUNG GALAXY NOTE8 Dual SIM 256GB 4G N9500 BLACK NEW. / 16GB Driving Kit / SAMSUNG GALAXY NOTE8 Dual SIM 256GB 4G N9500 BLACK. Condition is Used.PRISTINE CONDITION. This is a great phone and excellent value. (Not pictured - inside phone). Korean Model / Single SIM. CPU : Samsung Exynos 9 Octa 8895M, 2017, 64 bit, octa-core, 2560 Kbyte L2, 10 nm, ARM Mali-G71 GPU. Counterfeit goods will not be on sale. Plug Type : C, Electric Converter(For US) is included. Unlocked Samsung Galaxy Note 8 256GB SM-N950 S K L Black Blue. Model : Galaxy Note8. LTE : Band 1 / Band 2 / Band 3 / Band 4 / Band 5 / Band 7 / Band 8 / Band 12 / Band 17 / Band 18 / Band 19 / Band 20 / Band 25 / Band 26 / Band 28 / Band 38 / Band 39 / Band 40 / Band 41.